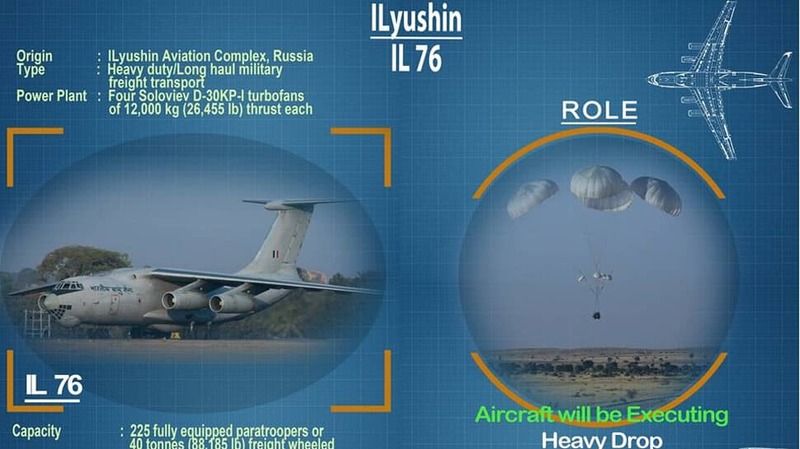 The Ilyushin IL-76 strategic airlift aircraft will take part in the Indian Air Force exercise Vayushakti 2019. A multi-purpose four-engined strategic airlift aircraft, Ilyushin IL-76 is a heavy duty, long haul military freight transport. At the exercise, there will be a fire power demonstration to showcase the ever-increasing potential of its combat platforms and to assure the citizens, its ability to safeguard India’s national interests. These exercises are also vital for operators, planners and the leadership. It provides an opportunity for forces to operate in near realistic scenarios. Aerial displays, formation fly pasts and Fire Power Demonstrations are various facets of training in Indian Air Force. They are also a great source of morale boosting for participants and an assurance for viewers. The Vayushakti will also witness Asia's top fighter jet Sukhoi Su-30MKI in action. "The Su-30 MKI is a modern multi-role, air superiority fighter aircraft of Indian Air Force. The aircraft is capable of decimating adversaries in air or on ground with the wide array of air to air & air to ground weapons," tweeted IAF. The IAF's Vayushakti 2019 event will be held at Pokhran Air to Ground Armament range near Jaisalmer in Rajasthan on February 16 from 5.45 pm onwards. The event is a demonstration exercise to showcase the prowess of its air-warriors and 'magnificent machines'.